Moloneymakes is an independent shop selling cosy handmade vegan knitwear and crochet. I was lucky enough to interview Moloneymakes about their shop and products. Hello! I’m very well, thank you; feeling excited as I enter my busiest period of the year! If I’m honest, as I was growing up, I never thought I would run my own business. I’ve worked in hospitality my entire career, studied performing arts at university and assumed I would amble along in a similar fashion once I had graduated. It was only then, when university was over, that I became aware of a new path available to me. Whilst at university, I developed several mental health problems that drastically affected my life which led me to seek a tool, or coping mechanism if you like, to help me deal with what was happening. I originally learnt to knit at a young age so I had a basic understanding of the craft and I found solace in the meditative rhythm of the stitches which helped my mind to quieten ever so slightly. I haven’t stopped knitting since. I adore your business. What made you decide to set up Moloneymakes? It was during the beginnings of my recovery that the seed was sown. As I began to knit more and expand on my skillset, I had a couple of friends requesting a headband and a beanie for the colder months which, to my delight, they loved so much that they said I should start charging for the items I was making. I was introduced to the wonder of Etsy and the rest, as they say, is history. ‘Operation Etsy Shop 2016’ was born and I gave myself a year writing up my very own patterns, choosing my favourite yarn and perfecting my original range of items before officially launching ‘Moloneymakes’ on 29th August 2016. Why did you call your shop Moloneymakes? I didn’t intend to name my business directly after myself, but the name stuck when some friends and I were throwing around ideas. I think the alliteration gives it a nice ring! My shop sells a range of cosy, chunky, vegan knitwear featuring hats, headbands, mittens, oversized cowls etc. 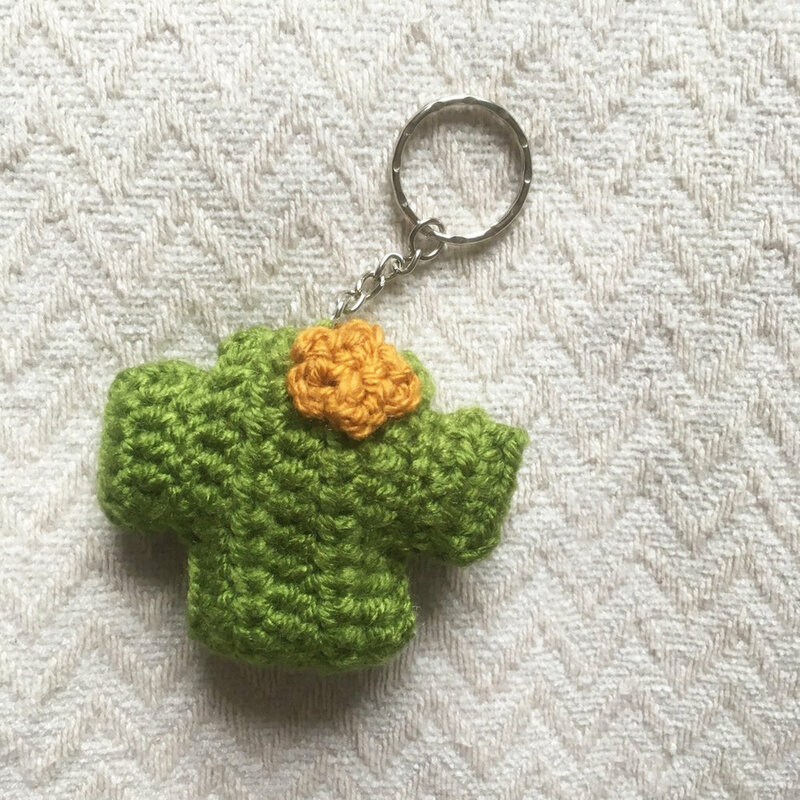 I also sell my own exclusive patterns and craft kits as well as a number of crochet items including cute little cactus planters and sets of reusable face scrubbies. I have to go with the popular Elliott Beanie. I made a prototype during the beginning stages of Moloneymakes when I was perfecting the pattern and I am so incredibly attached to it I barely take it off once the cold weather comes. I’m proud to say that it’s still going strong 3 years in! Aside from that, I am really into the Aurelia and Aurora Headbands that I released this season. The simple design is really effective and I love how versatile they are. I can have warm ears no matter how I am wearing my hair! How did you manage to learn and hone your craft? Honestly, I just keep practising and experimenting. There’s a lot of getting it wrong and frogging hours of hard work which can be exceptionally heart breaking, but it enables you to learn about what works and what doesn’t. In the beginning I bought a LOT of crafts and knitting magazines, and even now I am always finding new patterns by my fellow independent designers, or finding a new stitch to practise through Pinterest. I work full time as a barista so my typical working day is a busy one! Depending on how much I have going on, I have been known to work quite literally from the moment I wake up, squeezing in an hour before I leave for my day job, running my social media accounts during my break and picking up where I left off after work to the moment I go to bed. Recently, however, I have been trying my best to instil some much needed boundaries. I’ll work generally between 6:30 and 15:30 and simply extend my working day by a few hours dedicating time to focus on my business. Most evenings I’ll then go to a yoga class which should signify the end of my working day although I inevitably end up working up something in front of the tv, particularly now that I am entering the festive season and have a number of stockists, markets and orders to make for! One of the main struggles has been confidence, and I know I am not alone in this. Self deprecation and self doubt are rife in the maker community and can easily creep in and hinder your progress. Having the ability to recognise my inner critic and then having the confidence to answer back and react in opposition to her has taken (and still takes) a lot of practise and it can be scary. Oftentimes we are so held back by fear; fear of what could go wrong, fear of success, fear of judgement, of not being good enough… the list goes on. We don’t value ourselves as much as we do others and that is a huge spanner in the workings of a small business. It’s only when I started to take that on board that I was able to expand; I’ve been able to start pricing myself appropriately (seriously one of the MOST important things), networked and created opportunities for myself and I’ve been able to say no when I knew something really wasn’t feasible. I’ve certainly made mistakes and tried some things that haven’t worked which really throws my confidence and makes me question everything, but that only serves to teach you what works and what doesn’t; what’s right for your business and what isn’t. It’s all a massive learning curve that takes time and effort, but you just have to persevere. Social media has been amazing for my brand. For a start it allows me to connect with people who I would never be able to in everyday life and has sparked a huge number of friendships. I am also able to reach the maker communities all over the world which is absolutely fantastic. It’s a brilliant source of inspiration, advice and encouragement and I honestly don’t think I would be where I am today without it. I find inspiration all over the place, but I currently mainly draw inspiration for new designs from real life. As a general rule, my design process usually starts with necessity; so something I need, or want in my life right now, or a custom request. For instance, my wrist warmer pattern originated when Mum asked for something she could wear whilst working. In fact, one of my new patterns that I will be releasing this winter was created after my cousin asked me for a specific style of hat for a trip to Iceland earlier this year. I want to create products that meet a requirement; I want them to be practical. That’s one of the most integral parts of my design process. What can we hope to see in this up and coming year for your Instagram page? I’ve experimented a lot with new ideas this year, discovering what was right (or not quite so!) for Moloneymakes and I will be approaching 2019 with much more certainty and more of a plan than last. I’ve set myself a number of long term goals that I will be working towards, but you can essentially expect to see a lot more design work going on, experimenting with new stitches and techniques as I aspire to expand into garments and add to my current collection of patterns. I am one of the 5 who head the Bristol Etsy Team – we are a volunteer team of Etsy Sellers from Bristol who host events and offer support and advice through our social media and monthly meet ups. This year we are hosting a huge market across the first weekend of December at the City Hall in the cetre of Bristol and we have also paired with the Bristol Girl Bosses to bring a fantastic pop up shop together which will be based in the Galleries Shopping Centre. In more general terms, I’ve just released a brand new line of craft kits which is something I will be focussing on beyond 2018 as Moloneymakes progresses. As I mentioned above, the brand new craft kits will play a big part in the future of Moloneymakes. I’ve been doing a lot of work lately to connect back to my ‘why’. Why am I doing what I am doing? My reasoning behind my business is much more than simply selling cosy goodies. Don’t get me wrong, I still adore that part, but there was a deeper reason that drove me towards creating and ignites that fire in my belly. My motivation that drives the entirety of my business is that eventually I may be in a position to spread a little bit of that ‘thing’ that helped me several years ago. I want to help people find a little bit of mindfulness in their lives, a little moment of calm as their mind starts to quieten with the rhythmic movement of the needles. Whether it’s a moment for yourself after a long hard day at the office, or after taking care of the kids, or something a little deeper than that, it doesn’t matter. The important thing is that feeling; that’s what I want to help spread and share – the respite that can come with a few hours of stitching away with a cuppa and some biscuits close by. I think mood boards are a great tool for pulling together your own style. It’s a brilliant way of visualising your identity and creating a cohesive vision for your business, but also to cement your own aesthetic in your head. It’s a useful resource to come back to when you are starting to feel a bit lost and in need of some inspiration too. It keeps you on the right path and reminds you of your personal look so you can stay true to YOU, rather than imitating someone else or getting swept up in a completely different image or idea. Be aware of your strengths and weaknesses and use that knowledge to your advantage. Remember It’s okay to ask for help – in fact it’s way more than okay! Establish boundaries - do NOT work yourself into the ground, I promise it is not worth it. What's the best piece of creative advice you've ever been given? My best pal recently gifted me a lovely postcard by Martha Brook Stationery which said “It’s okay not to do it all” and that is something I come back to regularly. My best piece of advice probably comes in the form of my favourite print, funnily enough by the aforementioned pal: Sunshine For Breakfast. It reads “Think Big, Have Courage, Say Yes, Shine Bright” and it’s a bit of an affirmation for me as I muddle my way through the minefield of running a creative small business. You can find all of their products on Etsy ‘www.moloneymakes.etsy.com’, Instagram ‘@moloneymakes’ and Facebook ‘Moloneymakes Knitwear and Crochet’.